I managed to end up on this tour during the worst Tornado Draught for decades (according to USA Today). Not the best setting... We started with a decent chase day, followed by 4-5 down days, untill we finally caught some nice super cells. This kind of weather really puts a tour company (and its tour guide) to the test and I think Tempest Tours made it through. The down days were spent in the Texas desert which was quite pleasurable. When the storms started to pick up we ended up on the best performing storm in the state, well positioned, on pretty much every occation. 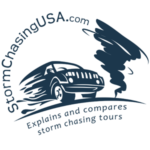 That is really the best you can expect from a storm chasing tour company. My major feeling about Tempest is that they are professionals. There is an attention to details, quality and safety that I really appreciated. Information before and during the trip was excellent (with some few exceptions) and the fact they send out a survey after each tour shows, of many small things, that Tempest are a real business and not just a bunch of storm chasers letting others tag along. Brian Morganti is a great storm chaser. He has the skill and the experience to know exactly what to do in every situation we were in. We were chasing during a record low season (a great low pressure made it snow in Oklahoma during our tour) but Brian managed to find the best performing storm almost every day. We had 4-5 down days during our tour but Brian brought us to interesting places on those days as well. On the negative side, it seemed that the stress of the bad weather (i.e. sunshine) affected his mood a bit and I would not have mind more information during the tour. I may not be the easiest tour guest though since I am highly involved in the chase and want to understand everything....for someone who likes to just relax and let the tour take you wherever, this will not be an issue. Although there could have been more information during the tour, there were **extensive** briefings every morning (45-60 minutes). They were **outstanding** especially if you, like me, really want to understand what's going on. Storm chasing is a numbers game and I would bet on Brian for the long run! With better weather conditions I have no doubt he would have found some tornadoes for us as well. A perfectly good, clean van with all the storm chasing equipment necessary. Additionaly, they have a big screen for the backseat, which is really interesting since you can see everything the tour guide can see on his computer. Having said that, the vans is one of the things that brings the grade down. Considering how much time is spent in (as well as getting into and out of) the van during a chase I think a bit more attention could be spent on the comfort in it. The seats didn't give any real support and there were no neck support. This might seem like tiny details but it was a bit annoying after a while. A PA-system in the van in order to hear the tour guide and WiFi is something I missed as well.